The very robots that Musk says will revolutionise the car industry are baking in Tesla’s mistakes and costing far more money than they’re worth, they say. 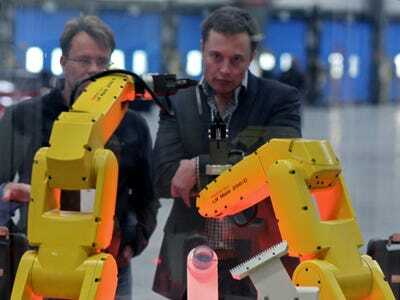 In a rare win for humans over robots in the battle for labour efficiency, Wall Street analysts have laid down a compelling argument that over-automation is to blame for problems at the billionaire Elon Musk’s electric-car company. That is to say, the very innovation and competitive advantage that Musk says he’s bringing to the car industry – his nearly fully automated plant in Fremont, California – is the reason Tesla is unable to scale quickly. According to the Bernstein analysts Max Warburton and Toni Sacconaghi, it’s the robots that can’t pump out Tesla’s highly anticipated Model 3s fast enough. The whole process is too ambitious, risky, and complicated. “Tesla has tried to hyper-automate final assembly. We believe Tesla has been too ambitious with automation on the Model 3 line. Few have seen it (the plant is off-limits at present), but we know this: Tesla has spent c.2x what a traditional OEM spends per unit on capacity. Bernstein adds that the world’s best carmakers, the Japanese, try to limit automation because it “is expensive and is statistically inversely correlated to quality.” Their approach is to get the process right first, then bring in the robots – the opposite of Musk’s. It’s not a problem that Tesla, a highly indebted company, can afford forever. The company’s stock has cratered more than 25% in the past month on worries that it will yet again underdeliver on its Model 3 promises. Over the past few days, investors have been selling Tesla’s debt in droves. On Tuesday, Moody’s downgraded Tesla by one notch, to B3, citing a “significant shortfall” in Model 3 production. During Tesla’s fourth-quarter earnings call, Musk told investors that factory model assembly was the biggest constraint on Model 3 production. There are tens of thousands of components in each car, he said, and the company can only move as fast as it can correct each problem area. 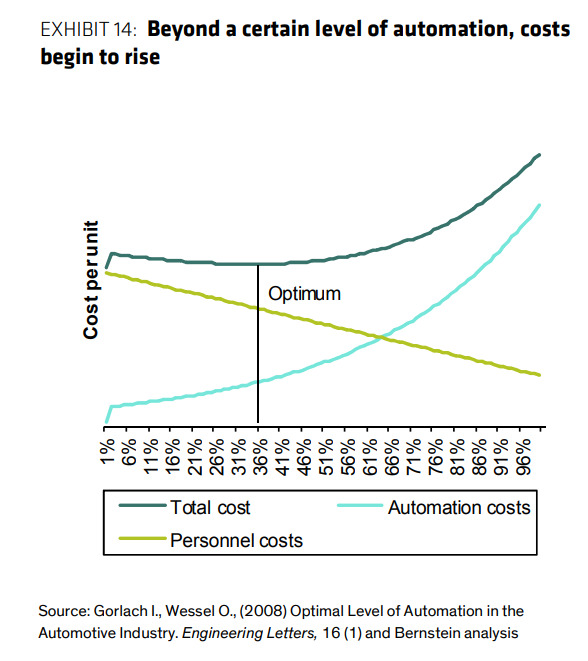 One thing that makes it hard to solve problems in every area, according to Bernstein’s analysts, is that they’re all automated. Other car companies that have tried this – Fiat and Volkswagen – have also failed. “Let’s say there are 10 hours of labour in final assembly (the part of the production line where parts, interiors and the powertrain are installed in a painted bodyshell). 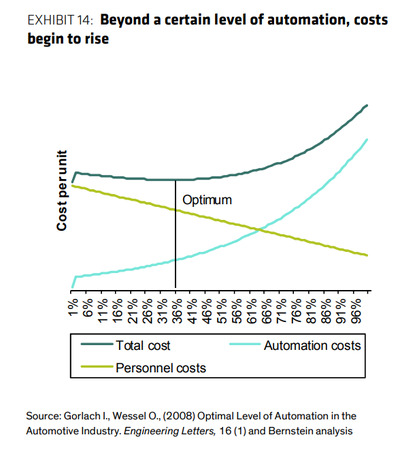 In a regular plant, final assembly typically has less than 5% of tasks automated. If Tesla attempts to automate 50% of these tasks, it could cut out 5 or so hours of labour. This might save $US150 per car (assuming wage rates, all in, of $US30 per worker, per hour). “But while all that exotic capital might allow Tesla to remove 5 workers, it will then need to hire a skilled engineer to manage, programme and maintain robots for $US100 an hour (our estimate of a robotic engineers’ hourly rate). So in Musk’s attempt to bring on the robot uprising that will revolutionise how we make cars, he’s burned cash and baked in his own mistakes. If you think about it that way, we are just beginning to understand how much this will cost him.